Zimbra Desktop has already made its market and name across the world, Zimbra Provide instant services of emailing, messaging, managing mails, tasks, sending files, attachments, calendar, etc. No doubt Zimbra Desktop is great email client but there are lots of peoples who still prefer Microsoft Outlook as their default email client, so if you are one of them and want your all pervious emails in MS Outlook then keep reading… You just have to follow the few steps and you can import you Zimbra emails in Outlook without missing any single files, trust me, I have already done this task. Step 5 - Next you will be asked for the save file or to open the file >> Choose save file option >> Select the destination to save the file >> Click on OK.
Now go to the selected location to check the file, on the location you can see the zip file so you have to unzip that file by any external tool like WinRaR, etc. (Right click on Zip file and click on Extract file option). Make sure that File extractor tool has to be installed in your system. Because I have already used this software and I experienced its conversion process, there are some qualities which I would like to share about this software so that you can know about the software. Single Mailbox - It allows single Mailbox migration, saving entire mailbox in single PST. Multiple Mailboxes - allows selection of multiple mailboxes kept in a folder, creating separate PST file for each mailbox. Option available with Enterprise Edition only. Step 1 - Choose “Single Mailbox” and press the Next button. Step 3 - In the next dialog box, you will see a check box “Delete Source file(s), during conversion… Check mark it, if you want to delete files from source location after migration, or leave the option blank and click on “Start Migration” button. Step 4 - Now you will be prompted to choose the location for saving the converted PST files. Choose the location and press “Save” button. 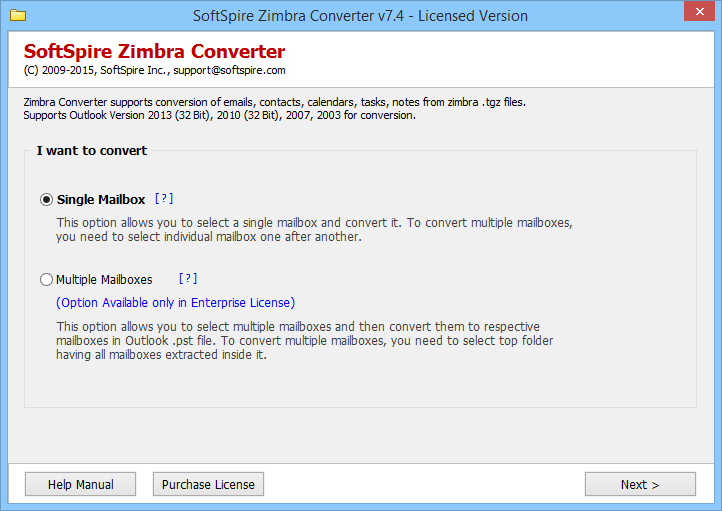 Step 5 - After conversion is complete, a dialog box will appear showing successful conversion of Zimbra Mailbox to PST. Step 2 - Press “Select …” button to select the folder comprising all mailboxes, extracted from .tgz file of Zimbra desktop. Step 3 - Here you will get a list of all the selected mailboxes. Click “Check All” option for converting all mailboxes at once. If you don’t want to convert any of the folders, simply unselect them. This will remove the checkmark corresponding them. Step 4 - Click “Change” button to select the destination location for saving the output PST files, and click “OK” button. Click “Next” button. Step 6 - Press “Start Migration” button. Once the conversion process is complete, a success message will appear showing All Zimbra Mailboxes converted successfully. Make sure that Microsoft Outlook is installed in your system and proper account configuration is must to open and read the PST file.